SIGN UP FOR "THE VIEW" OLYMPIC VIEW ENEWS! 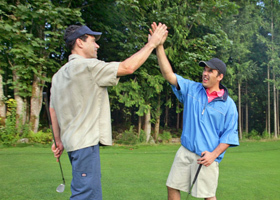 Olympic View is home to the award winning GBC Golf Academy. Covering over 14 acres and stretching to 330 yards, the state-of-the-art facility features expansive grass tee decks, five target greens and three comprehensive short game areas. Golf isn't the only thing we're known for! Displaying floor to ceiling windows and a scenic wrap-around patio with views of holes 1, 10 & 18, the fresh, locally inspired menu at Forester's Resturaunt is the perfect location to enjoy a delicious meal or refreshing beverage with friends and family.